I am scheduled to be interviewed tonight (Sunday, July 29, 2007) from 11 to midnight Eastern Time (8 p.m. to 9 p.m.) on "Sound Off", the John W. Spring live radio program. 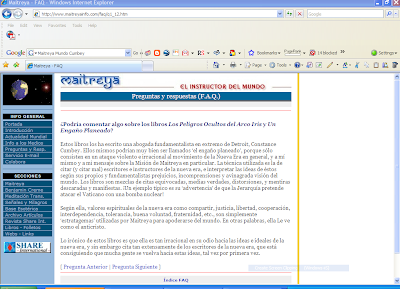 It is on various small stations about the country and also live on the internet at www.TheMicroEffect.com. The chatroom will be open as will be a live 800 number for questions. Please join us! Topics I think will be included are: (1) The Real ID Act of 2005; (2) EU and Javier Solana; (3) the New Age Movement. NOTE TO MY PERSPECTIVE http://www.themicroeffect.com/ listeners: My guest tomorrow, this Saturday, 11 a.m. Pacific time, 2 p.m. USA Eastern time will be Los Angeles political commentator and talk show host, John W. Spring. We will be discussing our mutual concerns on the Real ID Act of 2005, its ramifications and implementation. Your participation in the chatroom is invited -- even urged. This is an important program and only complete public education on this subject has any prospect of slowing its insidious progression. PLEASE JOIN US! Dr. Stanley Monteith will be with us a week from Saturday. Click on link to open below story; click on picture below to enlarge for readable size! Give Javier Solana more staff. 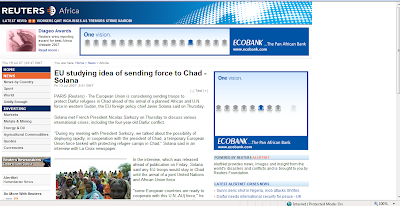 its extensive resources are used to support the EU’s diplomatic strategy. . . . Co-author Steven Everts thereafter not surprisingly left the CER to take a position on Javier Solana’s cabinet. Charles Grant stayed behind, also to the benefit of Javier Solana. The CER ideas were instrumental in shaping notions that would be incorporated in shaping Javier Solana’s to be all powerful Foreign Minister post in the failed European Constitutional drive. · A semi-permanent president of the Council will replace the 6-monthly rotating presidency. The various formations of the Council of Ministers will still be chaired by the rotating presidency. commissioner for external relations, Benita Ferrero-Waldner). · A new double-majority voting system for the Council of Ministers, under which a decision is passed when it is backed by 55% of the members-states, so long as these represent 65% of the EU’s population. · The powers of both national parliaments and the European Parliament in EU law-making will be strengthened. · From 2014 onwards, the Commission will only have 18 members (the seats will rotate among the 28 EU member-states, with Croatia likely to join before 2014). When there was obviously popular rejection by the peoples of the affected countries themselves to this acknowledged “democratic deficit” power grab, new scheming began. That culminated in the recent treaty meetings and there seems to be an obvious “the people be damned” approach to it. British elements are trying frantically to force a referendum. Eurocrats and global elitists are frantically trying to stop one from happening. Obviously, what is being framed here is much larger than simply Europe. Why else would a USA based group hand $10,000 for a simply worded essay that suggests handing one man, Javier Solana, such unilateral power and control? revival of Russian power, and so on. The English based CER has plenty of praises for Germany’s Angela Merkel and her Foreign Minister, Frank-Walter Steinmeier for expediting the process. At the same time, they appear unduly anxious to hand inordinate powers to one man in what appears to be one of the greatest “trust me” games in history. My mother told me never to trust somebody who says “trust me.” I would never say never, but I would definitely say that when one is very anxious that you forego a referendum, I would personally double my caution. What are the terms of this “treaty” that the CER is so anxious for the British to uncritically accept, sans referendum? Why are some on the USA side of the “Atlantic pond” so anxious to hand one man in charge so much power, money, and staff? call this a treaty - it's not. It's exactly the same - it's a constitution.’"
Do you regard the new version of the constitution as being radically different to the original? If so why are all of the following wrong? Well, as a famous wit once said, “A rose by any other name is still a rose.” And I might add that “a skunk by any other name is still a skunk.” And tyranny by any other polite moniker such as “democratic deficit” is still tyranny. I don’t want to tell my British cousins what to do, but if I were them, I would stick to my guns and demand that referendum. They have nothing to lose but their national identities and their freedoms! And ditto here in the USA where we have the not so subtle pushes for “global governance,” also under the “benevolent” guidance of Dr. Solana aided by the Brookings Institution, Stanford University, New York University, and with the apparent blessings of even our USA State Department. I often tell my law practice clients, “there are two things one should never rush into: one is marriage and the other is divorce.” I think on a national and global scale, we should be very cautious about rushing into a union we may well live to regret. If the prophesied revelations are true, and given the present objective evidence, I cannot help but believe they are, truly union with this global governance scheme will be ultimately and tragically regretted by many. NOTE TO MY PERSPECTIVE http://www.themicroeffect.com/ listeners: My guest next Saturday, 11 a.m. Pacific time, 2 p.m. USA Eastern time will be Los Angeles political commentator and talk show host, John W. Spring. We will be discussing our mutual concerns on the Real ID Act of 2005, its ramifications and implementation. Your participation in the chatroom is invited -- even urged. This is an important program and only complete public education on this subject has any prospect of slowing its insidious progression. PLEASE JOIN US! Dr. Stanley Monteith will be with us a week from Saturday. Tony Blair vs. Javier Solana? Tony Blair has departed from his ten year held British Prime Ministership. His old job is now held by Gordon Brown. Over, it was said, the displeasure of Javier Solana, European foreign policy and security chief, Tony Blair was given a position as The Quartet's envoy to the Middle East. This happened with the active backing of George Bush. Javier Solana was said to have unhappily gone along. Later it was announced that per Javier Solana, Tony Blair would have no power to mediate Middle East Israeli-Palestinian disputes. As Prime Minister of England, Tony Blair and his lawyer wife, Cheri Blair, unquestionably became used to "living large." As a couple, they also while professing a form of Christian allegiances, flew their New Age flags flagrantly and blatantly. In Mexico, they participated in a New Age initiation ceremony that consisted of them taking the personalities of animal spirits and bowing to the four elements. Now that Tony Blair has his new job which as I understand it now is basically to be a promoter to attract business opportunities to economically strengthen the region to the benefit of Israelis and Palestinians alike, he is again planning to "live large." According to a recent press release, he is viewing what is described as "a palace" with an eye to making that his Jerusalem home. He is said to be keen to take over the one-time residence of the British High Commissioner for Palestine, with its ballroom and spectacular view of the golden dome of Al-Aqsa mosque. The house, built of Jerusalem stone in 1931, was once the pride of British diplomacy and occupies a commanding position in West Jerusalem on the inauspiciously named Hill of Evil Counsel, where Judas is said to have negotiated his betrayal of Jesus. It has acres of lush gardens filled with delphiniums, roses and trees. After the British mandate ended in 1948, it was taken over by the United Nations. The same article tells what we already know. Neither Blair nor Solana are happy about the present structure. It appears that Tony Blair is not happy with its limitations. It appears that Javier Solana is not happy with Blair's new job existing at all. It should be very interesting to see this one play out. Stay tuned! Presently, I'm betting that Javier Solana will come out on top, but then, who knows? BIG JOB OPPORTUNITY FOR SOLANA'S "EUROPEAN NEIGHBOURHOOD POLICY" - READ ABOUT IT HERE! CLICK TO ENLARGE TO SEE THIS CLASSIC JOB OPPORTUNITY FOR THE EU AND CLICK ON THE TINY URL TO SEE WHOLE THING. I SUSPECT I WOULD QUALIFY FOR THE JOB BUT WOULD, UNFORTUNATELY, HAVE TO CONFESS A CONFLICT OF INTEREST! Minister of Propaganda, er, "Public Relations"? IS JAVIER SOLANA NOW GOING TO SPEAK FOR EU AT UN? Listen and interact via the chatroom live with me Saturday, July 21, 2007 at 11 a.m. Pacific time, 2 p.m. Eastern Time at www.themicroeffect.com! Holly Pivec, daughter of Herb Peters, is our first hour guest! MEANWHILE BACK ON THE ISRAELI FRONT: Israel's historically most New Age president, Socialist activist Shimon Peres, the man who signed the original Treaty of Association with Javier Solana and the EU on November 20, 1995, two days before I came upon these players, is once again the President of Israel and working enthusiastically with Javier Solana . You may link to it by clicking: http://tinyurl.com/32vjhz. Holly Peters Pivec also has links to it on www.FulfilledProphecy.com. Things are happening SO VERY FAST! Stay tuned! 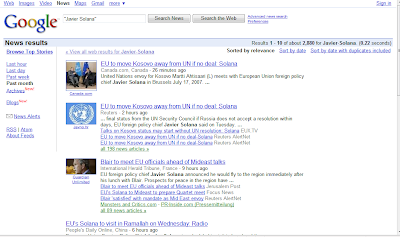 ENGLAND, FRANCE TO SURRENDER UN POWER TO SOLANA? If a very recent British newspaper article is to be believed, Great Britain may soon surrender its permanent Security Council seat at the UN to the European Union’s Javier Solana. According to EU Referendum blogspot, Great Britain won’t lose their Security Council seat, nor will France, but the EU will instead have its own seat. Britain and/or France will have to defer to the EU and remain silent at the UN Security Council, should an issue arise on which the EU has taken a “common position.”  Whichever version of this is true, it will unquestionably mean a much greater role for him ( or any successor) on the world stage. 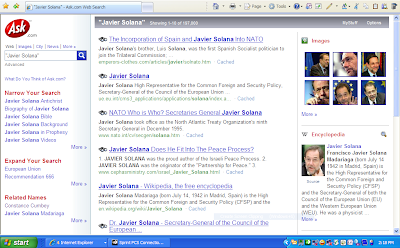 Since October 1999, Solana has headed European foreign and military policy. He also serves as Secretary General of the European Union Council of Ministers. 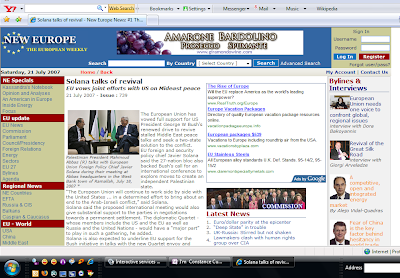 Also, since November 20, 1999, Solana has headed the Western European Union, a ten permanent member military federation. That was to have been a “temporary” one year stint, but I cynically note that the “year” has lasted a very long time and that job is still in existence. Solana uses the WEU job for holding military-industrial confabs that might not be as non-controversially available to him in other venues. Since assuming his initial EU governmental roles, his powers have steadily grown. He now is playing an obviously prominent role in “global governance” as well. 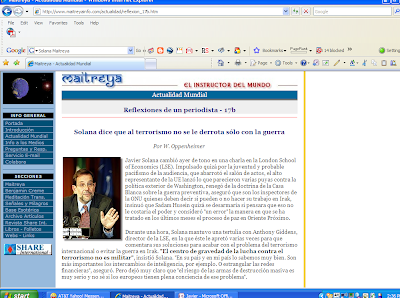 My personal tracking of Javier Solana began in late November, 1995 – November 22 to be precise. As a culmination of his dual six month rotating presidencies of the European Union and Western European Union, Solana executed and signed a comprehensive Treaty of Association with Israel on November 20, 1995. Only one week later, he would preside over the first Barcelona Conference designed to battle religious fundamentalism, set the stage for a Mediterranean Free Trade zone to be launched in 2010, and eliminate and/or reduce USA presence in the Mediterranean. Two days after the conclusion of that conference, he would be unanimously selected as a “dark horse candidate” to the disappointment of former Dutch president Ruud Lubbers who aspired to the job, to be the new Secretary General of NATO. More surprisingly still was that this NATO job came to him only a scant few months after he dispatched Spanish warships against the Canada he declared a virtual state of war against. Conceding that 666 job establishing Europa code section numbering may have been accidental, Javier Solana was shortly after taking that job, also placed in charge of the ten nation permanent member Western European Union. This happened on or about November 20, 1999. A lavish global governance party was held at the Palermo, Italy, luxurious New York University Law School owned villa. It was formerly the property of Sir Harold Acton. Page 666 of Sidney Blumenthal's book, records another global elite event. On November 20, 1999, just about the same time, maybe the very same day that Javier Solana was handed the ten national Western European Union presidency, a star studded dinner was held. The event happened near Florence, Italy. Sidney Blumenthal acted as toastmaster. That night, November 20, 1999, the Clintons, the Blairs, Gerhard Schroeder, and so many other world elites were in attendance at it, the Villa La Pietra. So was Javier Solana. He is specifically mentioned on that interestingly, perhaps coincidentally, perhaps not numbered page 666 of the Blumenthal book, THE CLINTON WARS. "The Villa la Pietra is a sixty room, fifteenth century mansion containing priceless art works and surrounded by acres of manicured Tuscan gardens filled with statuary. Through the pines, more than a mile in the distance, can be seen Brunelleschi's magnificent dome on Florence's Duomo. At La Pietra on November 20, 1999, a dinner was held to open a summit meeting of the Third Way Movement -- Progressive Governance in the Twenty-first Century. . . . "Around the tables sat European Commission president Romano Prodi, European foreign minister Javier Solana, Director-General of the International Labor Organization Juan Somavia, Prime Minister Tony Blair, Prime Minister Allesso D'Alema, Chancellor Gerhard Schroeder, Prime Minister Lionel Jospin, and President Fernando Henrique Cardoso, President of Brazil. . . Under the auspices of New York University and the European University Institute in Florence, prominent intellectuals from the United States and Europe joined the party. . . "
Topping all of this was the entertainment. Famed blind Italian tenor Andre Botticelli sang arias. Solana is a former physics professor and long time Spanish cabinet officer. He is an admitted former Marxist. So far, he appears to be little noticed or is intentionally ignored by the USA's mainstream media. He has had a steady growing stream of powers handed him starting, apparently, in November 1995. In 1995, the six month rotating presidencies of the Western European Union, a ten nation military federation, and the European Union coincided for the very first time. Both rotating presidencies belonged to Spain for that six month period. Both were handed to Javier Solana to handle on behalf of the Kingdom of Spain. He was a mere cabinet officer for Spain at that time. He had also been spokesman for the Spanish government, from 1985 to 1988 while serving as Spain's Minister of Culture. As the six month rotating president of the European Union, coinciding with one as well for the 10 Nation Western European Union, he executed the first of many Mediterranean area "Treaties of Association, with Israel on November 20, 1995. One week week later, he launched the Barcelona process which was an admitted hoped for Roman empire reconfiguration. Fifteen nations from Europe and 12 from the Middle East would participate. Ehud Barak represented Israel. Yasser Arafat represented the Palestinian Union. Barak proudly told the delegates at those sessions how happy he was that Israel had at long last joined "The European Club." "We have beaten our swords into plowshares," reportedly said Barak. Only two days after that event from which the USA was excluded, except as an observer, Javier Solana would be named the new head of NATO. 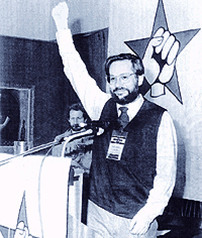 Canada, whose Nova Scotia's maritime economy had been virtually decimated by actions earlier that same year by Javier Solana, curiously went along with Solana's unanimous dark horse candidate election. Solana has also been given sole powers to shut down Europe's Space Agency in case of emergency. He is also working diligently to consolidate all military powers of the European Union. This means a potential army to him of 2 million men and modestly estimated 160 billion Euro budget. Javier Solana is an apparently ubiquitous enigma. He looks bluntly totally harmless. I would describe him as being appearance wise as "somebody you would buy a used car from and feel perfectly safe, everybody's favorite uncle, everybody's favorite professor, the most comfortable pair of old shoes in your closet." In short, he looks perfectly safe. Is he? His publicly revealed petulance over Tony Blair's appointment reveals another side to this man -- a more pensive, darker side. His declared antagonism to USA religious feelings in 2003, his disregard for the religious feelings of Serbian Orthodox believers who are seeing their religious capital, Kosovo, ripped from them, his disregard for the Gush Katif Jewish Gaza settlers who were forcibly dragged from their former homes, only to have Gaza turned into a new terror center for the rest of Israel. 'We now know that we must bring together the world of soldiers, diplomats, judges and development experts. More fundamentally the old system cannot cope because power is shifting away. Within political systems: to the media, markets and above all to individuals. . . . These days, there is less obedience. Who wants to be a follower if you are constantly told you can be what you want to be? It is striking that in Britain, the slogan for the recruitment for the army has changed from "Your country needs You" to "Be all you can be". On July 14th, Javier Solana celebrated his 65th birthday. It appears that France and Great Britain gave him some pretty big presents in the form of the new European treaty. Solana has long coveted Security Council access. This time, it appears he just may have gotten it. I hope my present impressions about this man and his career are wrong. If they are not, may the Lord help us all! http://www.telegraph.co.uk/news/main.jhtml?xml=/news/2007/07/20/neu120.xml: Article by Bruno Waterfield in Brussels, “EU will take Britain’s EU seat, says Hague.” July 20, 2007, Telegraph.co.uk. Blumenthal, Sidney. The Clinton Wars. Farrar, Straux and Giroux, New York: 2003. Citing page 666-667. The actual paragraph may be read online under a “search inside” feature on Amazon.com’s website, http://www.amazon.com/Clinton-Wars-Sidney-Blumenthal/dp/0374125023. CLICK ON IMAGE TO ENLARGE AND HAS HERB PETERS SO OFTEN REMINDED US, stay tuned! Reminder: HOLLY PETERS PIVEC WILL BE MY FIRST HOUR GUEST ON MY PERSPECTIVE THIS COMING SATURDAY. SHE WILL BRING US UP TO DATE ON THE WORK SHE AND HER HUSBAND ADAM ARE CONTINUING FOR HERB PETERS AND HER OWN LONG TIME WORK OF ANALYZING THE APOSTOLIC REFORM MOVEMENT. YOU MAY "STAY TUNED" FOR THIS BY JOINING US SATURDAY AT 11 A.M. PACIFIC TIME AND 2 P.M. EASTERN TIME at http://www.themicroeffect.com/. This was on the front page Yahoo! news today. Here's a snapshot in time, in case it vanishes on line as sometimes happens! Looks like Blair is reporting to Solana to at least this observer! Javier Solana is talking very BIG today! NEWS FLASH: HOLLY PETERS PIVEC WILL BE MY FIRST HOUR GUEST ON MY PERSPECTIVE THIS COMING SATURDAY. SHE WILL BRING US UP TO DATE ON THE WORK SHE AND HER HUSBAND ADAM ARE CONTINUING FOR HERB PETERS AND HER OWN LONG TIME WORK OF ANALYZING THE APOSTOLIC REFORM MOVEMENT. YOU MAY "STAY TUNED" FOR THIS BY JOINING US SATURDAY AT 11 A.M. PACIFIC TIME AND 2 P.M. EASTERN TIME at www.TheMicroEffect.com. AND A MOUTH SPEAKING VERY GREAT THINGS???!!!! I sat quietly at lunch today. At a nearby table, I could not help but overhear three middle aged to elderly ministers . They were gravely discussing what was of pressing spiritual importance to them today: (1) Bible colleges in Grand Rapids, Michigan and in Canada; (2) Stock market investments; (3) what they considered to be the total resilience of the USA's economy. I did an online google.com search over lunch and found the information you see in picture form above (click on it to make it page size). I was so very tempted to go to the ministers' table with my laptop and ask them for their reaction to today's news. I showed the story together with the Europa code section 666 creating Solana's job to the waitress. With a gasp, she grasped it immediately. The three ministers all seemed like gentle spirits. However, they clearly appeared clueless as to prophetically significant world events. Hopefully, when the prophesied times eventually come to pass -- which they will -- these gentlemen too will wake up. Looking at these headlines, it is time we all awake and smell the coffee! I plan to write a detailed article tonight for NewswithViews.com. Watch for it there. 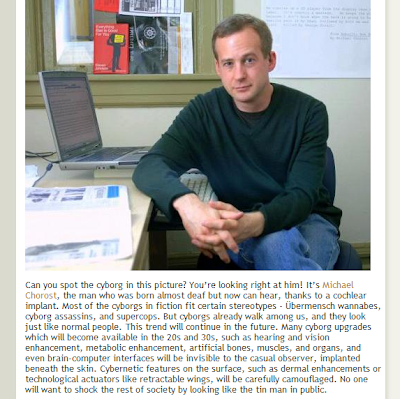 I was researching "transhumanism" when I chanced across this little contribution on my web surfing. All apologies to the man whose hearing was restored by a cochlear implant, but notice carefully the reference to brain implants! If the print is too small for you to read, click on the picture to enlarge it to full page view. You may read the whole ugly report by clicking here. My brilliant colleague and peer in New Age research work, Mrs. Dorothy Margraf, will reverse roles with me on MY PERSPECTIVE tomorrow, July 14, 2007, 2 p.m. Eastern time, 11 a.m. Pacific Time, 12 noon, Mountain Time, and 1 p.m. Eastern Time. Dorothy is going to interview me about my work over the past 25 years, my law practice, the New Age Movement, my research on Javier Solana, etc., etc. Please join us either live by telephone (numbers will be given on the air) or in the chatroom at www.TheMicroEffect.com. Stay tuned! THE NEW AGE MOVEMENT IS HUGE AND GROWING! "In The Magic of Findhorn, the story of the community by Paul Hawken, the author relates how Robert Ogilvie Crombie (Roc), an associate of the Findhorn Community met a spirit being whom he recognised as 'Pan'. This being, during the course of the ensuing conversation, asked him, 'Do you love my subjects?' "Yes'. In that case do you love me?' 'Why not?' 'DO YOU LOVE ME? "Yes' ...'You know of course that I am the Devil? You have just said that you love the devil.' 'No you are not the devil. You are the god of the woodlands and countryside. There is no evil in you' There are many other references in the book to contact with spirit beings. . . . In Biblical times, there was never any shortage of false prophets to reassure Israel and its kings that "good times" were coming as God's judgment and disaster instead loomed. Today's times so painfully parallel those ones. I started sounding alarms about the New Age Movement in 1981. In 1982, my work was publicized by a converted Detroit Free Press reporter. Worldwide full page newspaper advertisements appeared on April 25, 1982. They proclaimed "THE CHRIST IS NOW HERE." The ads had been no surprise to me. The Detroit Free Press had authorized its reporter to begin working on the story that appeared on May 5, 1982 after learning in April 1982 that "Tara Center" would be spending upwards of half a million dollars to run such ads globally. Obviously, the spending of half a million dollars -- worth much more in that economy than now -- had a very serious purpose. Somebody was not doing it on a whim or a prank. The delusion to the New Age proponents of the scheme was that they were safe from premature detection. They honestly believed what Alice Bailey and other doctrinal adherents of the New Age Movement in its multitude of forms expressed: that nobody could understand their teachings but "an initiate." Planetary Citizens founder Donald Keys happily wrote in his 1982 EARTH AT OMEGA: PASSAGE TO PLANETIZATION that so far the New Age Movement had eluded detection "by alarmed forces and defenders of the status quo ante." Keys was in for a surprise as was his much wealthier and influential sponsoring mentor, Norman Cousins. They had been detected and alarms were sounded. The alarms were somewhat muted, however, by "Christian experts" who rushed in to say nothing was happening. There was no "New Age Movement," and if there was, which was doubtful, "they certainly were not networked politically." It has occurred to me more than once that the New Age Movement may have created its own "opposition." Spiritual Counterfeits Project is listed in many New Age directories from the early 1970's under its original name of "World Christian Liberation Front." The Spiritual Community Guide listed it as "a Community where people live together to get on with the aims listed under Center." In the key to New Age Centers, they cited that the purpose of the "New Age Centers" was to advance the spreading "New Age." It was obvious to those who would look that the Movement had been steadily moving since the 1960s. The Unity and Diversity Council in 1965 launched its first council with none other than former United Nations leader U Thant as a keynote speaker. The event was held at San Francisco's Cow Palace. Ten thousand were in attendance. The same people were running the event as are running various Peace Sundays with no small success now. Leland Steward coordinated the Unity and Diversity Council. Those mass events continued to grow and in 1979 it was Leland Steward's umbrella coordinating organization that successfully brought Benjamin Crème to the United States . They were truly moving "great guns," until May 1982. That's when people started looking critically at them. Spiritual Counterfeits Project (SCP), Christian Research Institute (CRI), and so many others, included but not limited to Fr. Pacwa (now running EWTN) gave critical aspects of the New Age Movement cover while they could regroup. They have now regrouped and once again believe themselves to be in striking position. Author Paul Hawken, who wrote a book I heavily utilized in writing my book, THE HIDDEN DANGERS OF THE RAINBOW, "THE MAGIC OF FINDHORN," now focuses on the all important environmental wing of the Movement they used to call "The New Age Movement." His book, Blessed Unrest: How the Largest Movement in the World Came in to Being and Why No One Saw it Coming (Viking). Well, I saw it coming -- most clearly. Many others did too. They were shamed into silence by a seemingly strange alliance of Evangelicals and New Agers. Jeremy Rifkin was given public access to Christian media to propagate the alliance. David Spangler bragged openly post 1987 "Harmonic Convergence," and beyond, the "Gold Lake" evangelical prostitution conferences held in 1987 that ongoing meetings had been taking place of which the one he had just left in Boulder (coordinated by Doug Coe and chaired by Barbara Marx Hubbard). Now using Biblical language, "the transgressors have come to the fore." [Q] "You write about how this evolving movement will look very different from movements of the past. [A]There’s no charismatic leader, no center. It’s not ideological. That’s often lost in the reporting of it, because what’s reported is the resistance point of a group saying, “Stop. Don’t.” That becomes an interesting event from a media point of view. What goes unreported is the innovation, design, engineering, and social technologies. This is a movement of ideas. And sometimes ideas don’t work and you try another one and that works, and then you try and figure out how to make it work better. It’s an iterative, evolutionary process. It’s tens of thousands of ideas with respect to water, buildings, cities, poverty, women, education, climate and carbon neutrality. You can’t sum them up because they appear all over the place. But they actually do all point north toward a very different world than the one we live in now. [Q] You suggest that the politics of the future are really about fostering unusual alliances that revolve around ideas. Strange bedfellows—evangelicals aligning with environmentalists, for example. Are you seeing this elsewhere? It’s the same thing now as it was then. It's still about ushering in a new "Christ" -- one who is neither Jesus nor Jewish. Its still about shutting down traditional religious orthodoxies. It's still about their three main goals as I expressed in the in the 1980s: (1) a New World Order; (2) a New World Religion; and (3) preparing the world to accept their New Age Christ. Yes, and their New World religion is still about Lucifer. Its still about "Maitreya." It's still an anti-God Movement, yes, and contrary to what Walter Martin, Fr. Pacwa, Denver Seminary, Gordon Lewis, and the ubiquitous J. Gordon Melton may have told you, it is about taking over. Paul Hawken lies when he says there is no male vertebrate in charge -- then again, he may be right -- the Luciferic origins he himself acknowledged in his THE MAGIC OF FINDHORN, may not be a male vertebrate -- at least a human one. Hawken lies when he says this is new. He was clearly part of what I had analyzed in 1981 and he very well knows it. He is now emboldened, especially with his "evangelical" support" for significant parts of his movement. Hawken says this movement is the Earth's immune system response to religion and the like. Sounds just like earlier pronouncements of Peter Russell and Barbara Marx Hubbard that Judeo Christian religions are cancerous cells on the global brain which require removal. Hopefully, these ugly forces won't be able to claim your soul. Are you ready? * www.tmtestimony.org.uk/library/1998_9.htm Interesting to me also is this quote which is not attributed. Without looking at my 1983 THE HIDDEN DANGERS OF THE RAINBOW, I am quite certain that this is nearly word for word as published there from my 1981 and beyond research . I am, however, happy that the information is disseminated! I wonder if the scenes before Noah boarding the ark or Sodom & Gomorrah being destroyed could have been much worse than this one. I would appreciate comments! One of the new cases comes from Elmira, N.Y., where police arrested seven Christians who went into a public park where a "gay" fest was beginning and started to pray, faces down, while holding their Bibles. They were cited for "disturbing the peace," and Assistant Police Chief Mike Robertson said that the seven are accused of a "combination" of allegations under that statute, which includes the "intent" to cause a public inconvenience, any "disturbance" of a meeting of persons, obstructing vehicular or pedestrian traffic, or taking part in "any act that serves no legitimate purpose." The second such case arose in Wichita, Kan., where police arrested Spirit One Christian Center Pastor Mark Holick, who had received permission earlier from officers to be on the public sidewalk adjacent to the park where the festival was occurring but then was arrested doing exactly that. Julian Raven, a street preacher, said that his group of seven assembled to pray for three hours the night before Elmira's recent "pride" festival in promotion of the homosexual lifestyle. "We have a legal right to be at an event held in a public square. We're not a hate group," he said. "We're Christians and we're going to be there to pray." "The female officer, she said, 'You're not going to cross the street. You're not going to enter the park and you're not going to share your religion with anybody in this park,'" he said. "When she said that, for the first time in my life as a Christian, I felt now my freedom of speech is threatened or challenged," he said. "I was being told I could not share my religion with anybody in that park." Raven said he told the officer "she was violating the Constitution that she had sworn to uphold, and she was very agitated and adamant, and couldn't look me straight in the eye." He said his team of Christians then went into the park, holding Bibles over their heads to signify their subservience to God's Word, and lay on their faces to pray. Within three minutes, police officers had put handcuffs on the seven, to the cheers of the homosexual crowd, he said. He said a court date is pending for the seven July 23. "I have the highest respect for the police officers. They have a very difficult job to do. But we were treated unfairly in a public setting. This was a hasty show of force. It was not called for," he said. He said if the situation is left unchallenged, the city of Elmira will be in the position of being able to control the content of people's messages in a lawful assembly – or even thoughts if they are nearby. "We didn't say boo to a goose, still we were arrested," he said. The local newspaper reported the arrests came just "moments" after Elmira Mayor John Tonello delivered a speech "celebrating diversity." "I was appalled and disgusted by the gay stories strewn through the … paper. … What was even more disturbing was the way the city acted. Since when is it illegal to sit on the ground in a public park and recite Bible verses? Are they not protected by the same Constitution that allows gay people to have their gay pride event. These Bible thumpers had their constitutional right to free speech and assembly trampled on by the city. They should not have been arrested," said Kevin Raznoff. Robertson said that the Christians "certainly" have a right to assemble, but not on public property when there's an "organized" event there. Asked repeatedly about how the "disturbance" statute relates to First Amendment guarantees of freedom of speech, he did not answer. "Obviously, they caused a disruption to an event that was taking place," he said. But Raven confirmed that the seven Christians did not approach a single person, did not speak to anyone and did not even make any audible statements until after they were arrested. Pastor Holick's case in Wichita was even more drastic. He had gone, with a team from his church, to pass out flyers and pray at a recent "pride" festival held there. He had checked with the police department and was told, "The sidewalk is your friend." "Upon arriving we began to set up," he said. "Immediately, I was approached by WPD and told that we could not go into the park (a public park mind you where everyone else – except the Christians – was allowed in) and that we could not be on the sidewalk on that side of the street but that we could go to the other side of the street. "In other words, one side of the street is open to Christians but the public park and the public sidewalk next to the park is not," he said. But then Holick was arrested within about four minutes of his arrival. "It is obvious that the WPD did not keep their word and that they wanted to arrest as quickly as possible. The First Amendment … was cast aside like so much garbage," he said. "The sin is 'coming out' further and further and the church is now being pushed further and further back inside the four walls of the church building; we are the ones that are seen as 'the trouble makers.' The police arrest the Christians and allow all manner of perversion to flaunt itself in the streets of Wichita. And we the church … well … I'm not sure we care," he said. Police alleged that they asked Holick five times to "leave" the festival, even though he never purchased the required admission fee or went in. Holick already had been targeted by the Internal Revenue Service for the moral statements he posted on the church's sign. The notice he got from the IRS warned him about putting his Christian beliefs on the sign, and he responded that he would continue to preach the Word of God. Just a week earlier, it was reported that police in St. Petersburg, Fla., arrested five Christians for carrying signs "wider than their torsos" outside an officially designated protest area at that city's homosexual festival. Pastor Billy Ball, Assistant Pastor Doug Pitts, Frankie Primavera and Josh Pettigrew, all of Faith Baptist Church in Primrose, Ga., were arrested after leaving a small area set aside by city officials for protest activities. Bill Holt, of Lighthouse Baptist Church in Jefferson, Ga., was also taken into custody. According to Lighthouse Pastor Kevin Whitman, the five men were told by police their signs were not allowed outside the protest area because they were wider than their torsos. When the men refused to put them away, they were arrested for violating a controversial city ordinance that governs permitted events. St. Petersburg officials, following disturbances at a previous homosexual pride festival, implemented rules governing outdoor events that set aside "free speech zones," where protesters are allowed. Curious Triangle: Solana, Giddens, Creme? Cumbey Maitreya's foe? Go Team! UPDATE: SOLANA SPOKESWOMAN APPEARS TO EITHER RETRACT OR TAKE BACK STATEMENT -- MEANING? I SUSPECT A WORKING OF BOTH SIDES OF THE AISLE AND DELIBERATE CONFUSION -- A TIME HONORED GAME! Read about it by clicking here! 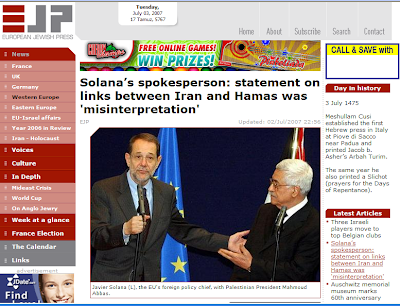 The news from Javier Solana today, nearly 13 months after he went to Teheran on June 6, 2006 to represent the world's interests before the Iranian government, is that he might be hardening his stance on Iran. 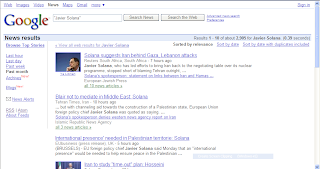 According to a Reuters press release of this date, Solana says now that Iran might be behind some of the latest and most serious terrorism in the Middle East -- in Gaza and elsewhere. BRUSSELS, July 2 (Reuters) - The European Union foreign policy chief suggested on Monday that Iran could be linked to the Hamas military takeover of Gaza, recent attacks on the Lebanese army, and on European peacekeepers in Lebanon. Javier Solana, who has led efforts to bring Iran back to the negotiating table over its nuclear programme, stopped short of blaming Tehran outright, but said the incidents could not be treated separately. . . . "What happened in Gaza cannot be seen separately from what happened in Lebanon," he told a conference on the Middle East hosted by the Socialist group of the European Parliament. "There are new groups in the Palestinian camps," Solana said. "And the fact that UNIFIL has been attacked for the first time cannot be taken separately." Constance Cumbey related to Javier Solana? Barry Chamish will be my first hour guest on My Perspective, next Saturday, July 7, 2007. The added picture is from today's http://www.dogpile.com/ search engine. The one below is the original one today from http://www.ask.com/. 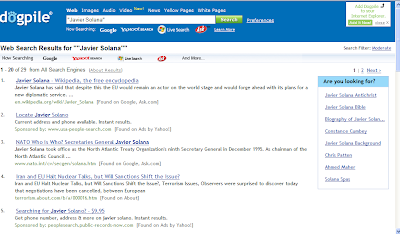 The search term used was "Javier Solana." Unless I had hit a sensitive nail on the head, why would they be noticing me, much less bothering with me? Check this. I have printed it out and made it available this way because of the charming way they play their little game of "now you see us, now you don't." This has been going on -- off and on -- with use of my name on various search engines as a category since the summer of 2003. Click the picture above for a full page view! Use your computer scroll key to see the entire screen, including, most importantly, "relate names." You won't be able to go to the links because this is a picture of the search engine Ask.com. In the past, this appeared on Excite.com; Teoma.com; Dogpile.com; hotbot.com; and others. Here's betting the http://www.ask.com/ configuration changes as soon as people start checking. That is why I have preserved this evidence photographically. Every friend I have insists I must not travel to Europe! COMMENTS ARE INVITED!